UPDATE: This store is no longer in business. Only open for two months, Green Goddess Consignmentis Vancouver’s newest consignment store in the trendy neighbourhood known to locals at “Kitsilano” or “Kits”. This is a new venture for Carol, the owner, but she has done her homework and created a store that is friendly and inviting, and has an incredible selection of women’s clothing that is both fashionable and affordable. Her consignment policy is flexible, with few restrictions. 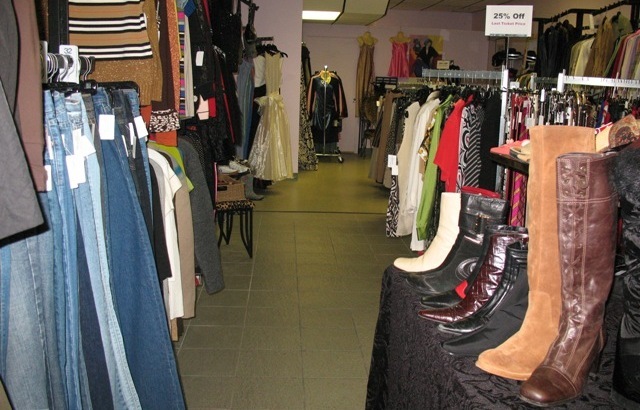 As a result she has already developed relationships with many women in the community looking to consign their clothing. Green Goddess therefore has a huge stock of clothing that ranges from casual to business all the way to evening and gala wear. There is also an excellent selection of accessories, jewellery, lingerie and footwear. Because she is open to looking at many different styles, Carol notices many different “pockets” of types of clothing. There is a section of trendy clothing that includes designer brands such as French Connection and local brands like Aritzia. There is also some “Vintage Drama” that includes exciting vintage pieces in perfect condition as well as some classic pieces from Talbots. And, for those looking for something a bit more eclectic there are recycled saris, linens and clothing made from bamboo and organic cotton. Carol enjoys being able to create a fun shopping experience for everyone and tries to help customers find what they are looking for. She will even keep a journal of specific items that women are looking for and do her best to get them into the store. To further the shopping experience, Carol also offers a series of events focused on topics related to personal beauty, health and style called Beauty & Brio. Many of these are offered in the store and in other locations throughout the community. Thank you so much for taking the time to check out the site…your feedback is much appreciated. The website is no more working. Thanks for letting me know, I will remove the link. I knew the store was gone but the site was still working up until recently.